Many things in Guatemala are unpredictable: the weather, the local bus schedule, how early the neighborhood rooster will start crowing. Corn tortillas, on the hand, are not. 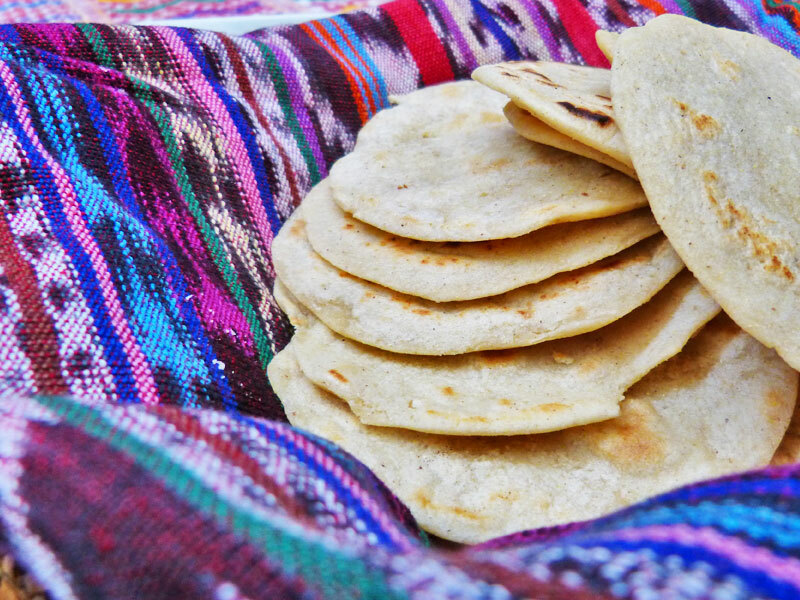 No matter where you eat, from a restaurant to a market to a local family’s home, tortillas are bound to accompany your traditional Guatemalan meal. 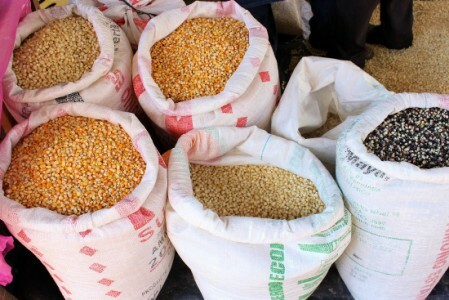 Corn is a fundamental part of Guatemala’s culture that dates back to the ancient Mayas. According to the Maya creation myth that appears in the sacred Maya book, the Popol Vuh, it’s what the gods used to create man, after other materials—like wood and mud—failed. Corn also appears in another famous Popol Vuh narrative about the “hero twins,” two brothers who went down into the gods’ underworld to rescue their father, who in turn became the god of maize—a god who emerges from the earth each year to give life to mankind. Today, corn is one of the staple crops grown by Guatemalan farmers. It’s typically harvested not when kernels are sweet and tender (as it would be for corn on the cob) but rather when kernels are fully mature and dry. This is the corn that’s used to make tortillas and that fills those giant white sacks that you see in local markets across the country. Tortillas are best served steaming hot. Tender and pliable, they have a delicate toasted-corn flavor and a pillowy texture. They’re great for scooping up sauces from a sloppy plate or rounding out the occasionally meager lunch or dinner. How many tortillas a person eats per meal varies greatly. Some folks stick to one or two, while others can down eight or more at a time. 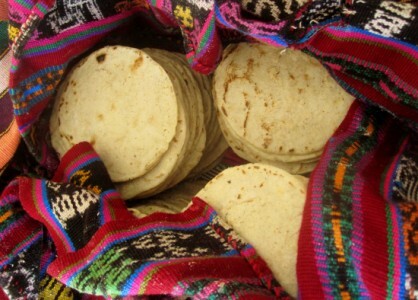 Fresh tortillas are sold from tortillerias (single-room spaces where señoras and señoritas prepare tortillas all day long), though people prepare them at home, too. Below is an overview of how. If you’re en route to Guatemala and would like to try to make them yourself, let us know. Viaventure offers a handful of tours that will help you become a tortilla-making master. 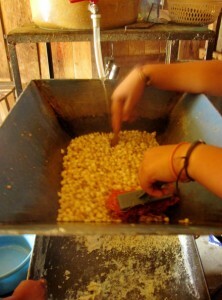 Dried corn kernels are purchased in the market or delivered to the door of a tortillería. The corn kernels are boiled with a cal (a chalky substance known as lime or calcium hydroxide) during a process called nixtamalization. Doing this makes it easier to grind the corn, increases its nutritional value, and improves its flavor. Once the corn is finished cooking and left to soak overnight, it’s rinsed. 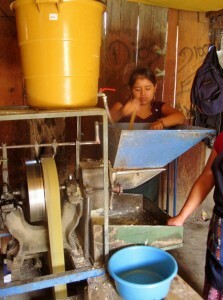 The cooked corn is then taken to a mill. These are usually small, one-room operations with a single machine. The corn is added to the top of the mill, along with a bit of water, and pushed through to be ground. 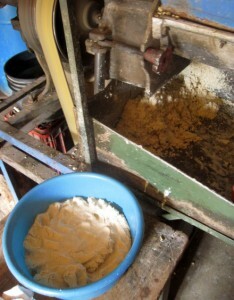 Now called masa, the ground corn is gathered up (its texture is similar to that of clay) and taken back home or to the tortillería. 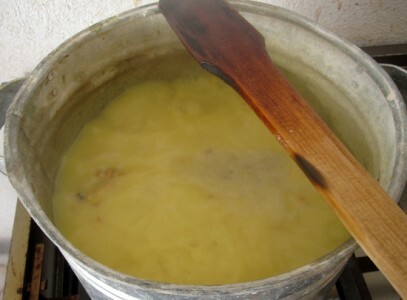 A bit of water is added to the mixture to make it more workable. 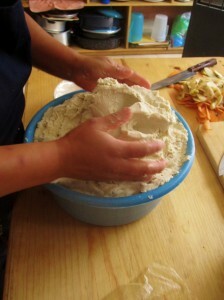 Handfuls of masa are then formed into small, flat discs. 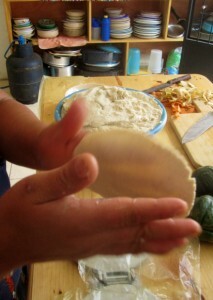 Señoras do this by clapping the dough between their hands, flattening and shaping it as they go along. 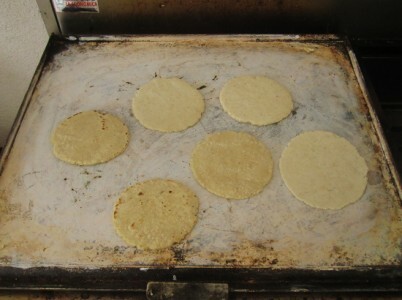 The uncooked tortillas are placed on a comal (a flat metal griddle–though they can also be made of clay) that has been rubbed down with a bit of cal to make it nonstick. The tortillas are cooked until golden and lightly charred on one side and then flipped by hand. Once the tortillas are perfectly cooked and steaming hot, they’re piled into a blanket-lined basket to keep warm. Buen provecho!